Sooo…things didn’t quite work out for the first week of the summer reboot. We just survived a thick heatwave, which always seems to kill my productivity (I tend to become an exhausted slug in weather like that). A few things have unexpectedly popped up, too, including a vacation for Independence Day. This month is also Camp NaNoWriMo, or Camp National Novel Writing Month, which encourages writers to finish a first draft of a writing project. I’m participating this year for a sci-fi, post-apocalyptic novel I’ve been wanting to do. It’s really exciting, even the prospect of writing 40,000 words-ish in 31 days is a little, well, intimidating. So instead of a ‘real’ blog, here’s a little update, and arty blogs and videos will resume this Tuesday. 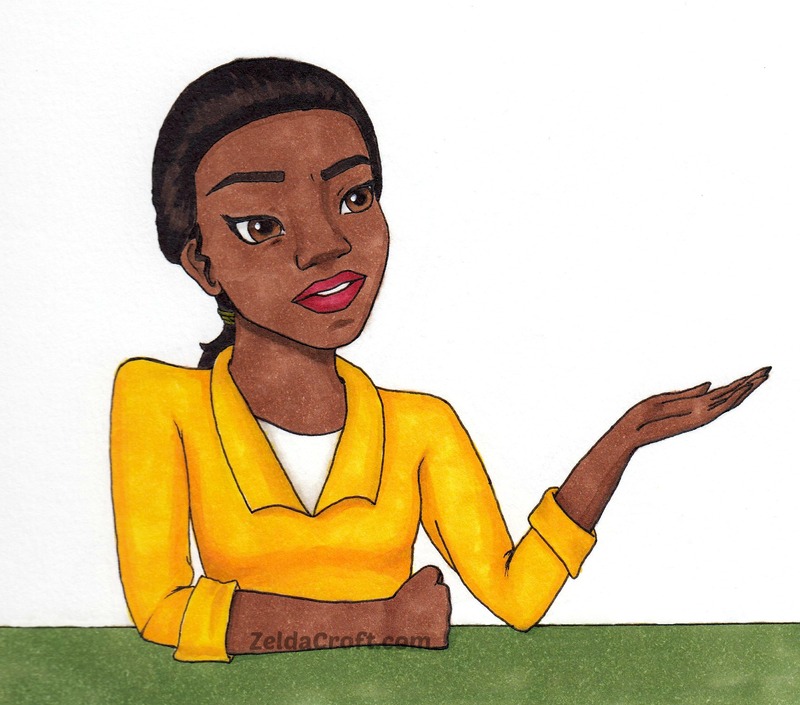 To make up for the unexpected break, here’s Tiana from Princess and the Frog, who’s also wondering why there’s no blogs. I’ve been trying to be more thoughtful with my color choices, so I tried to match them tonally with the style of the movie. Normally I don’t use a muted palette, but this sketch has inspired me to try it out with other artworks. Originally, she was reacting to what the TV show Once Upon a Time did to her character. It changed her from being a hard-working, lower class optimist to a typical princess (as well as a run of the mill resistance fighter). I got over it, but at the time I was frustrated the writers took away basically everything that made her unique. Anyway, today it felt like her expression fits how I feel about not having no content for a while. I’m sorry, but I’ll work to make sure there’s new stuff soon. Between taking my first college exams, moving to a new country, and having a bad case of bronchitis, my first year away at university was nothing short of a learning experience. It kept me busy, but as you can probably tell I wasn’t able to fit many blogs into that hectic schedule. Which was a shame, because I love writing and running this site. I also couldn’t finish (or even start) many artworks. So, I’m sorry to both you and myself for needing to take a break. To be honest, I ended up feeling very overwhelmed for much of the year. There were many good things, some of which will be featured in upcoming blogs, but some things like school and house work just snuck up on me. Plus, I sprained my (non-dominant) wrist pretty badly about an hour before my first exam, so it has been pretty much unusable since late April. 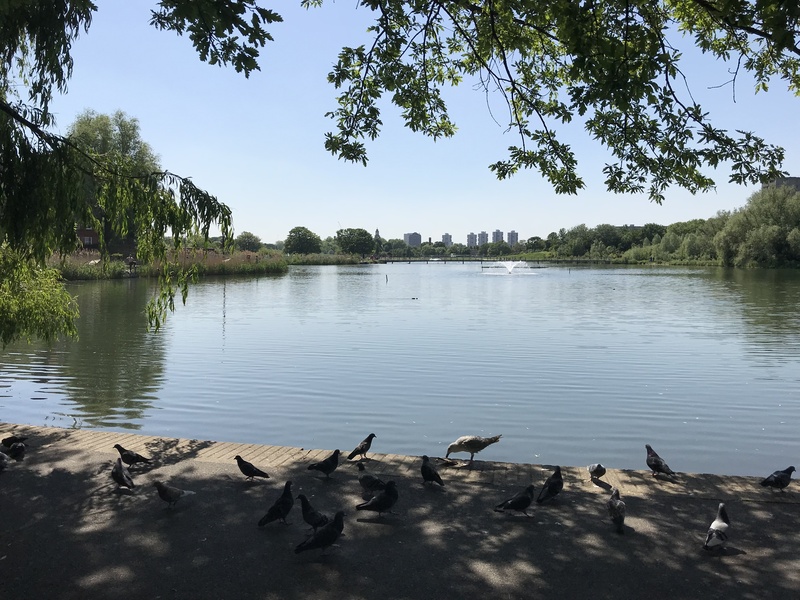 We took a break from packing to visit the beautiful Burgess Park in South London. BUT the good news is that I learned a lot about how to balance my studies, interests, and personal care in a healthy way. Moving forward I can try to find a mid-ground between my contrasting workaholic tendencies and procrastination habits. Especially now that I’m back home and my wrist is on the mend, I’m super excited about getting back to work on my art and writing. Happily, that starts this Tuesday with a consistent posting schedule. From then on, at least for the summer, you can expect a blog every Tuesday and Saturday. If anything changes, I’ll make sure to post on Twitter what’s up. Thanks to a new webcam mount, you’ll be getting more videos on my YouTube, too. While many will be speed draws about my creation process, I also have some new art projects and challenges in store. Whether they’re cheap art supplies, models, or more, you can look forward to seeing a bigger variety in my videos. To prepare, I’ve been inking a lot of the sketches I started in-between studying for tests. I’ve also been settling back into my workspace (a.k.a. a desk and some nice shelves in my bedroom), and taking stock of all the supplies its collected over time. I kept finding all these art products I had meant to use both personally and for content on here. This summer will be a lot of fun as I finally have time to use and write about them! So in short, you can now expect regularly scheduled blogs this summer, including resources, my art, and reviews of art books and products. Those you can expect to see every Tuesday and Saturday, with the former being more stories and review type blogs, while the latter will usually be art that I create. On my YouTube channel I plan to have one video a week on that art, with sometimes an extra one (depending on Tuesday’s content). If you subscribe and click the notification bell, YouTube should tell you every time a new video comes out. I’m very proud to share with you that I have been accepted to my dream school! 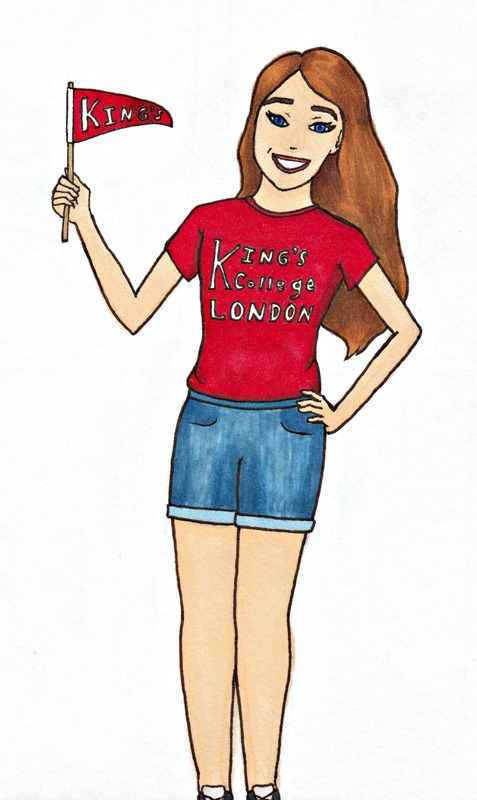 King’s College London is an amazing place to get an education, not to mention I’ll be living in London. When I first visited the city in 2010, I knew I wanted to live there someday– and now it’s really happening. So what does this mean for you? Starting this month (September), I’ll be able to bring you so much more content. Expect museum visits, urban sketching, and much more fun art history. I also will look for art groups, or ‘societies’ as they’re sometimes called there, so I can share with you a variety of artwork. Studying Classics and English in London is going to be one of the biggest adventures of my life. I look forward to sharing that journey with you and giving you access to what it’s like to be an artist there. Stay tuned! Is there anything in particular you’d like to see me cover in London? For example, a specific artwork or site you would want to see pictures, art, and maybe a video of. Let me know in the comments! It’s amazing how just one event can bring so many people together. And what better than an incredible astronomical one? She also found a neat and simple eclipse craft. Besides the pin-hole viewers, kids could also make their own total solar eclipse. 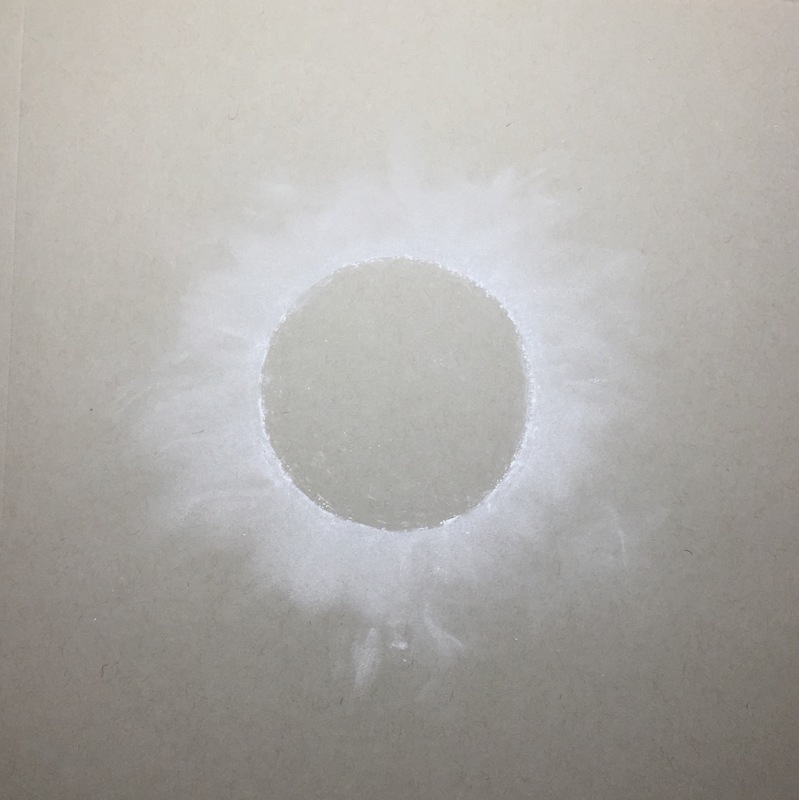 The idea is simple: you trace a circle stencil onto a colored piece of paper, and then use a white drawing tool to draw the ‘light halo’ of the total eclipse. For mine, I used my Strathmore gray paper and a white soft pastel. But any construction paper and white chalk will work. It was pretty fun loosely coloring the light rays. 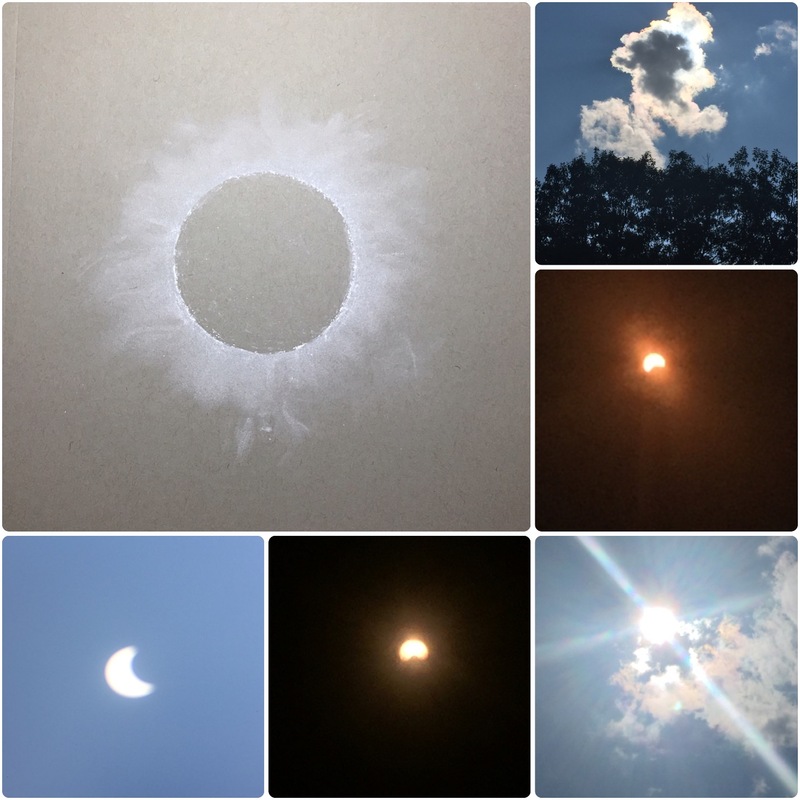 The dark images in the collage were taken through the special (and coveted) eclipse glasses. It started as an experiment, and happily it allowed my phone camera to see the moon’s crossing. Now what I’m super excited for is 2024. That’s when another total eclipse crosses America, and I intend on being where totality is. It’s sure to be a once in a lifetime opportunity! Have you ever seen an eclipse? Or would you like to? Let me know below! Fun Facts for Copic’s 30th! It’s no secret how loved Copic markers are by artists, or that they originated in Japan. But did you know that the name ‘Copic’ comes from their ties to copy machines? In celebration of Copic’s 30th anniversary, a creative team in partnership with Imagination International Incorporated (iii), the exclusive North American distributer for Copic markers, has put together a particularly interesting blog post. Featured is art made for the celebration by two Japanese artists: Mr. Kubonouchi and Mr. Fukuda. There are also pretty lengthy interviews with each of them, linked in their names to the left. Without further ado, here are some of the highlights. Back in the day, graphic designers needed to color printed copies for their work. Izumiya, a Japanese company, partnered with Magic Marker Corporation to make Speedry in 1969. The concept was to sell the 150 colors alongside Izumiya’s copier machine distribution. However, the ink of the printed images would smudge when drawn over with markers. Interestingly, Mr. Fukuda describes in his interview what it was like to use those first Speedry markers. Prior to that, he had used poster paint, which was a limited and timely product. Flash forward to 1987, and Izumiya released the first 71 Copic markers. Now known as the Classic model, they aimed to fix one problem: smudgy toner. Hence their name: Copic markers to use with copiers. Two years after their inception, the color number was doubled when 71 more colors were added to “serve a particular need of architectural design and figure painting.” Only three years after that, another 72 colors were made. This time, it was to cater to the markers’ use in fashion and environmental design. After Izumiya became the .Too Corporation, the famous Sketch model was released in 1993. Over the the next few years, mulitliners and the airbrush system were created to accompany the marker line. Ciaos were introduced as well, providing a slightly cheaper option for beginners. Copics have only continued to grow in popularity since. Beyond professional concept designers, the early 2000’s saw many colors added to match the needs of manga artists. The markers also found an audience overseas, and new colors were created for artists in the United States. The last new marker colors were created in 2012, “to meet the needs of craft market in the US.” Multiliners continue to evolve, with “elegant pink” and lavender having been added to the lineup in 2014 and 2016, respectively. While not included on the official timeline, 2014 was also when the limited edition 25th anniversary marker sets were released. Like the 30th anniversary post, iii puts out a lot of marker-oriented content. One of my favorite things about their website is the iii-Academy, an original manga made with Copics about Copics. Through fun lessons, mangakas Alisa Caves and Chihiro Howe’s comic teaches about using the markers, their accessories, and drawing in general. The characters are fun and the stories comical. You should check it out here! I’m happy to tell you that today is the launch of my coloring page, er, page. You may have seen, but there’s now a ‘Free Coloring Pages’ button on the header above. There you can download some fun line art to color—totally free of charge! As of right now, a chibi Hatsune Miku is taking center stage. If you want, you can check out this video of me coloring her with Copic markers for some inspiration. As everyone makes their New Year’s Resolutions, I’ve decided to set some goals I would like to achieve when it comes to my art skills (and artist-y things in general). Being an artist means you are always trying to move forward, improve your skills and creativity. Creating this list will help keep me going on that forward momentum. I thought you might be curious to see, too, what I want to accomplish this year in terms of drawing and art. Like any skill set, the only way to improve is through practice. Ideally, I’d like to at least sketch every day, but I’m not going to put that kind of pressured expectation on myself. Instead, I will sketch as often as I can. As for the subjects, I would like to vary that as well. So far I am pretty good at deer and moose, and okay at figures. Increasing my ‘repertoire’, if you will, to include and improve a greater variety of animals, settings, and people is important to me. I’m going to work to get better at backgrounds in general as well. Architecture and urban settings have always been daunting to me, and I’d love to be able to draw them much better by the end of this year. I want to be comfortable putting myself, and artwork, out there. Perhaps because I am very aware of my own art shortcomings, I tend to notice those issues in my drawings, without acknowledging my successes. Overcoming that is essential when it comes to my ambitions for this blog and YouTube Channel. Besides that, I know it is important for me personally to break out of my comfort zone this way. Time to say goodbye to that little inner voice of Self-Doubt and hello to Confidence. Along a similar vein to the goal above, I can be a perfectionist sometimes when it comes to making art and writing. My mom would tell you I absolutely am. It is a bad habit that keeps me rigid when I should just relax and create. My favorite works, whether drawn, painted, or written, have come from when I got out of my own way and let the inspiration take over. While I won’t always have inspiration to pull from, I want to allow my ideas to manifest without the interruption of my ‘inner editor’. This also means not being afraid to experiment and just play with different ideas and mediums. I’m really excited about this goal, because I look forward to unlocking my somewhat stifled creative self. I’ve always enjoyed just putting pencil to paper and creating an illustration with that tool alone. It feels traditional yet applicable to any subject matter (dragons, anyone?). From the bit I’ve dabbled in inked illustrations, there is a similar feeling. It’s the closest to ‘fine art’ I’ve gotten. The concept of being able to create many different textures with a single pencil or pen is intriguing to me. This year I want to go from the occasional loose sketch and Inktober drawing to following tutorials and improved drawings. Last year I bought some acrylics and watercolors. I love the feel of them, and am excited about creating with paint on both canvas and paper. But I didn’t make much time for them. This year I am going to change that. As I said above, I look forward to playing with a variety of mediums, paint included. Brace yourself for some paint-y speedpaints! So there they are: my general art goals for 2017. I hope you follow me on this journey, where you can see my work-in-progress and finished pictures on Instagram and Twitter. Also be sure to check out my YouTube to see speedpaints, speeddrawings, art hauls, and more!